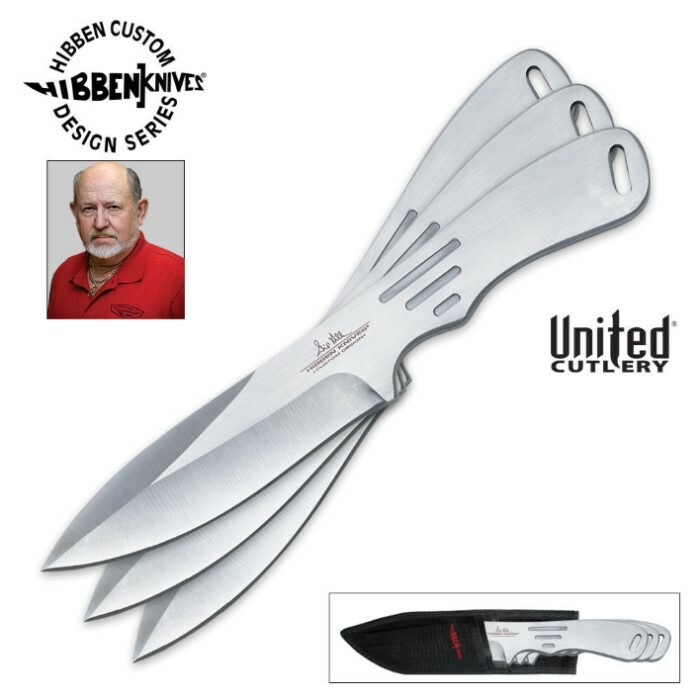 Famed master of the blade, Gil Hibben has designed this throwing knife set for the avid adventurer and trainer. Balanced and with a geometry suitable for throwing and hand held use alike, this is a go-to throwing knife kit for target practice, hiking and outdoor treks. Solid, single piece of steel construction. Blade geometry suitable for both throwing or held cutting knife use. Lashing hole at end up handle can be used for attaching a tail. Includes nylon sheath with hard inner liner to prevent points from poking through. Each knife measures 8 5/8 in. overall. Master your skill: Gil Hibben is also an instructor and published the detailed Professional How-to Guide For Knife Throwing. I combat(no spin)throw, and these are my fav. Granted all the tips broke soon after purchase,but i reshaped them and they have lasted 4 years and counting. these are very cheap. i threw them the first day and they broke this is just for show, and they are not even appealing to the eye. Studied at length to decide which knives to buy. Chose these. Within and hour of throwing had broken two tips. I'm afraid to throw the third again. May break it too. I wouldn't advise throwing this knife into a hard target like, uh, wood. It might be better suited for throwing at a compressed cardboard target. Or human flesh, if that was legal. Just don't hit the bone. I recently bought these knifes and they seemed to throw ok but in a month or to two tips had broken off making them useless, I have never seen a knife brake so fast I would not recommend these knifes too anyone. Just got these and they are awesome! UPS just delivered these big boys. They are awesome! I have been throwing them at a squirrel target. I have squirrels on my roof, bird feeder, and all over. They are brazen too. Not frightened off by anything. I have no dog or cat. So I can get close enough to throw this knife. I can't wait for the first kill! Bye bye squirrel! These feel great in my hand and fly really straight at the target. Get these and have some fun! This is a nice looking knife but, unless your good at throwing I wouldn't recommend these knifes for a beginner. I own three and the tips will bend or break by not pulling them straight out of wood or when they stick the target at left & right angles over time. I've been throwing (combat) style or (quarter spin) for over a year and enjoy throwing this knife, Although I am a little disappointed in MR. HIBBENs designed in this KNIFE with such a thin long tip, given his reputation. Don't miss understand me, All of my knifes are his but this one disappoints me only at the tip.